We are privileged to interview Paul Hellard, former editor of CG Society and Ballistic Media, who shares with us his stories on his career in working across the media in filming, sound recording, editing, writing and publishing. – Working as a script editor and then picture desk co-ordinator . – Being the assistant editor of “Design Graphics” placing Paul in “tech heaven” where he wrote and edited feature articles, technology updates, hardware and software reviews. – The design objectives of the EXPOSÉ series of Digital Art Annuals. – The experience at CG Society posting feature articles, the news and managing the social media posts. – Paul’s global view on the “game changers” of digital art over the years. – Those main individuals who influenced Paul as he worked in various media industries. Greg Teegarden is a computer graphics supervisor at Digital Domain, a visual effects and digital production company based in Venice, Los Angeles, California. He has been in the industry for over 20 years and has worked on productions including SeaQuest 2032, The Fifth Element, Tron : Legacy, X Men: First Class, The Girl with the Dragon Tattoo and more recently the Oblivion movie starring Tom Cruise. He has been nominated six times at the Visual Effects Society for his work. – How Greg’s father, James Teegarden, who was an art director and set designer for Back to the Future II, Artificial Intelligence and E.T. influenced Greg. – How Greg got started professionally in visual effects. – The experience of working as an animator on Seaquest 2032. – The influence of Industrial Light and Magic. – Some of Greg’s earliest visual effects tools including Lightwave. – Greg’s experience on the sci-fi movie Oblivion, which starred Tom Cruise. – Using Terragen to create a procedural generated Earth for the opening scene in Oblivion with the Universal Studios logo. – Some of Greg’s highlights at Digital Domain. – The benefits gained from managing production pipelines at Digital Domain. – Some of Greg’s work on Tron : Legacy as the lighting supervisor. – Advice from Greg for those who are looking to get into the visual effects industry. -What Larry believes will impact the reader the most when they open up the map set and guide. -How some awkward canon elements were properly fitted in, including squeezing in the Delphic Expanse. -About the maps from different races of Star Trek. -What did each of the artists Larr worked with bring to the table for this project. -How the Dominion War (Deep Space Nine) was placed onto the maps in a way that makes sense. 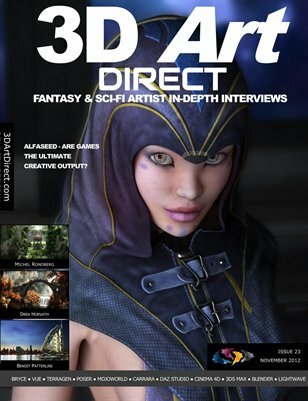 Don’t forget that Ali Ries who we interviewed in Issue 33 of 3D Art Direct magazine contributed to this publication with her wonderful nebula artwork, creating a couple of the maps and the box artwork. He is an experienced software developer with 20 years of experience. His field of expertise is developing applications for both Mac OS and Windows that assist computer graphics artists achieve photorealistic results. He founded Prêt-à-3D (www.preta3d.com) in 2010 , a company dedicated to bringing high-end computer graphics tools to the masses. His Reality software for Poser and DAZ Studio has been used for video game illustration and for the preproduction of Hollywood large budget movies such as Jurassic Park IV and Hunger Games: Catching Fire. – His first contact with DAZ Studio the strengths he noted from it during his early use of the software. – Whether he immediately saw a gap in the market for the book? Or did it take some time for you to identify some needs of the DAZ Studio community that could be fulfilled? – We talk about the by-line of the book “Community Experience Distilled”. – The book cover artwork. – Paolo is an educator and writer in the 3D Arts world, but this Was Paolo’s first book project. What were some of his early barriers he had to overcome in starting up and getting a writing regime going? – Who the the book is aimed for? – The mind-set barrier of being able to pose figures naturally when first starting and how this book overcomes that barrier. – How the book covers creating new characters with morphs – the ability to start adapting existing characters to create new ones. – The practical content of the book – customising DAZ studio, finding and installing new content and navigating the studio environment. – The aspects of lighting covered in two major chapters : lighting a scene and achieving photo realism with the Reality Plugin. – How the new Dawn figure is covered in the book- what readers can learn about using this figure. – Paolo’s favourite topic or chapter. Dawn is for both Poser and DAZ Studio users in mind, with two versions available, one with native Poser files compatible with Poser 9 and above, and another with native DAZ Studio files compatible with DAZ Studio 4.5 and above. I’m also pleased to announce a new live and on-line conference for the Poser community: Poser Expo 2 : Creative Professionals Live. Chris Creek and his crew from HiveWire 3D will be the keynote speakers at the beginning of the conference, and then we’ll go into nine more webinar sessions of Poser training content on the weekend of the 18th-20th of October, with some of the brightest and creative minds in the community presenting. At the moment there is a reduced price for the event tickets that will get you into ALL the webinars. Up until around the end of September, you can take advantage of a 23% discount on the ticket price. – The build-up for the release of Terragen 3 and som of the early feedback of T3 as features of it became public. – How Terragen 3 started. Was it based on the platform of Terragen 2, or is it a completely new product written from the ground up? 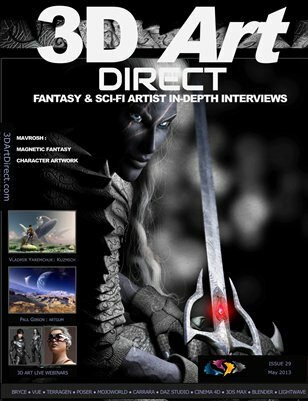 – The story of how T3 was utilised for the sc-fi film Oblivion. – The T3 Global Illumination Surface Details option. – Fast and noise free depth of field in T3. – The new spherical camera option. – When T3 becomes available and what will the variants of the software be? 3D Art Live is planning to create a new TERRALIVE webinar based conference for the Terragen community, this time with a focus on the new Terragen 3. In this session, we get behind the scenes of D&D Creations and learn how this powerful partnership of Drea Horvath and Michel Rondberg was created. Many people in the Vue community will have heard of least one of these names, so you can discover more about this partnership in this session, what they did in their early years to get to the level of success they have achieved now. Even they are suprised how fast they have got involved in commercial and non-commercial productions of bigger studios in a relatively short time. It’s been only since the start of the year since they officially launched their services, but during their first few months they has already worked on a cinematic trailer, a historical animation, and building scenes for a big commercial 3D projection mapping project. If you have considered animation in Vue or are trying to improve or optimise your animation work in Vue, Make a note of this live webinar event in your diaries which will be on the 3rd and 4th of August; the first weekend in August. It’s entitled “Animating Nature” and the URL to book a webinar seat is 3dartlive.com/vueanimation, so we hope to see you there or take advantage of the recording. The MasterClass webinar event is recommended to Vue users from intermediate to professional level. If your goal is to become a professional, if you’re already in the industry, or if you’re just interested in learning to animate the digital nature, these webinars are suitable for you! Check out this animation teaser to see what kind of effects you can achieve with animating nature in Vue. BONUS!!! – If you register for our MasterClasses, you will get an exclusive 50% discount coupon for one-time use in the D&D Creations Digital Store. All MasterClass attendees will also get an exclusive 3D content to download. – Recommendations of what the latest versions of Vue can offer, especially to newer artists. – How Drea and Michel were introduced to 3D landscape art. – How Michel released his own album at 15! 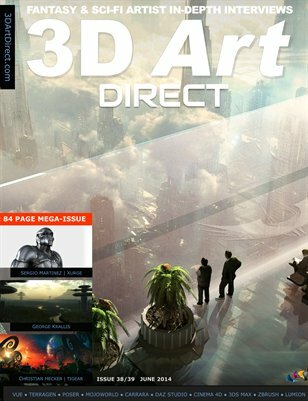 – How Drea was invited to provide the cover artwork for 3D World issue 156. In this session we learn how a hobby for computer games and graphics led to a notable visual effects business headed by Tobias Richter based in Cologne, Germany called “The Light Works”. His company is now used by main industry clients such as Atari, CBS Digital and Lucas Arts as well as indie film producers for quality visual effects. – Tobias has an amazing working environment, filled with sci-fi physical models that act as a great reference to creating virtual ones. – How physical model building is a useful discipline for virtual modeling. – How The Light Works company started. – The secrets of how high quality visual effects are created on a relatively small budget. – Tobias’s main tools and workflow. – The Light Works involvement in Star Trek Phase II. – Tobias and Fedcon – a major annual Star Trek convention in Germany. – Tobias’s visit to George Lucas’s Skywalker Ranch. Check out a reel of completed projects at thelightworks.com and look out for stuff in production at their facebook page. If you’ve enjoyed this session, let us know your feedback at iTunes. Sergio Martinez from Xurge3D creates custom outfits for Poser. As a content creator for Poser, Sergio has invested many years in this application, starting out with Poser 4 back in 1999. 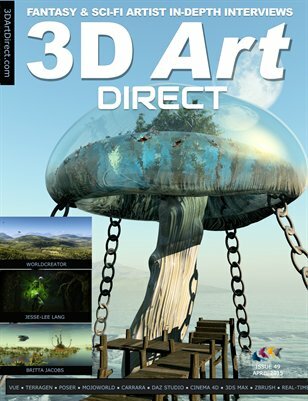 His specialisation is in fantasy and sci-fi outfits which fits right in with 3D Art Direct’s coverage of the sci-fi and fantasy genres in the 3D Digital Arts world. We’re very pleased to interview Sergio in this Podcast session and discover his passion for clothing design and providing some outstanding content for Poser. 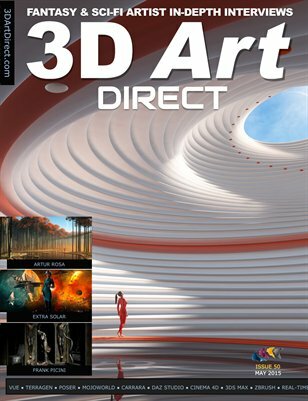 Be sure to visit www.xurge3d.com since there is a deep discount sale at the moment that is due to end very soon. Ever wondered how to create Poser accessories and clothing? Sergio will reveal step by step how he creates his custom clothing with his three part live webinar conference on Saturday 8th and 9th June 2013. Go to www.3DArtLive.com to register. – What got Sergio hooked into Poser clothing content creation. – What were some of the most difficult challenges you had to overcome when bringing his content to market. 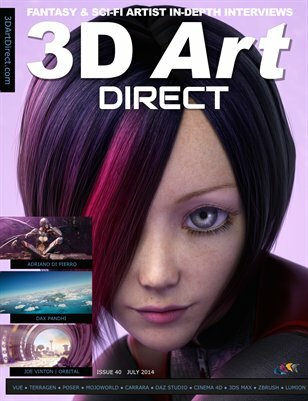 – Find out which Poser character continues to attract the most sales for Xurge3D. – What is “conforming clothing” for Poser. – What’s been the most satisfying product for Sergio to create and why? – Where have some of Sergio’s influences originated from for clothing design. E.J. De la Pena is an Actor/Film Maker with more than 20-years experience in the entertainment industry. He’s been a child actor who has earned dozens of credits – including projects like Jingle All The Way and Boy Meets World. He is now the president and founder of the film production company Cowboy Errant! Neil Brook Johnson (July 26, 1967) is a British film and music video producer, director, and editor best known for his long association with heavy metal band Manowar, and for directing and writing Science Fiction Films. Neil is regarded as a pioneer in digital film-making. He has to his credit over 20 years experience in the industry including 6 feature films and 500 music videos. – The George Lucas connection! 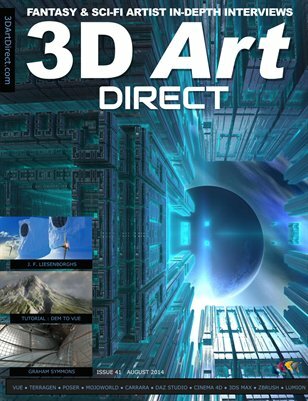 Now Amy Chopin is equally busy, she’s the author of 3D Art Essentials, which is a great start for 3D digital artist in getting to know the basics on the history, the terms of 3D art. But it covers modelling, posing, texturing, creating scenery, animation and rendering. Vladmir is originally from Moscow, Russia and now lives with Amy in Utah, in the United States. I started asking Vladmir about his early experiences with film and classic animation whilst in his teens. Vladmir’s early exposure to film and classic cartoon animation whilst in Moscow, Russia. Learning what were some of the earliest 3D software tools that Vladmir used. Ami’s career as a professional writer who’s written “3D Art Essentials: The Fundamentals of 3D Modeling, Texturing, and Animation: The Fundamentals of 3D Modeling and Animation’ . The insertion of images of live human figures into a Vue scene, as an alternative to using Poser. Thoughts of where Vue should evolve next. This session is a little different from what 3D Art Direct podcast normally presents, since this time we are exploring the making of a science fiction series –which will be a drama/comedy produced with the aid of crowdfunding. The series is called C.A.S. Nobility – that has the tagline of “These are not the heroes you’re looking for.”. Nobility is the name of the starship in this series with a curious crew of characters on board. The project is notable because of it’s story, and because of the amount of passion and power behind the project which is generated in gigawats by E.J. De la Pena, the producer AND because he has managed to cast the actress Claudia Christian (from Babylon V) . This project was brought to my attention through Danny Gordon, who is the new conference and community manager for 3D Art Direct. He is one of the 3D artists on the project and invited me to follow the production of this series. I’ve always had a great interest in the production and what goes on behind the scenes of sci-fi television series and films. I mentioned that this series was going to be funded by crowdfunding. What is crowdfunding? It’s a financing method that involves funding a project with relatively modest contributions from a large group of individuals, rather than seeking bigger sums of money from a small number of investors. In this case E.J. De la Pena (E.J. for short), the head of production for this series is using Kickstarter.com for the crowdfunding campaign. Now if you’ve never been to Kickstarter.com, it’s definitely worth a visit, firstly to check out E.J.’s campaign for Nobility and to contribute to his project. Secondly to see some of the other projects going on. Forinstance a few months ago, we noticed that a new version of the classic 3D vector game Elite was going to be remade through Kickstarter.com, so there are some projects definitely related to 3D graphics that are being funded through this clever means. So I’d urge you to look at E.J.’s project at nobilitytheseries.com, view the fun campaign video he has created for Nobility. In this first interview with E.J., we find out how the whole project started, how Claudia Christian came onboard. We learn how the story and characters were crafted, we talk about the Nobility ship design and discover some of E.J’s production team. The new “wow” factors of Reality 3 for Poser users. Paolo also presented at the Poser Expo : Runtime Live conference, held between the 22nd and 24th of March 2013, which was the first ever conference Poser users, presented through our 3D Art Live webinar service in partnership with Runtime DNA. I give a special thanks to all the presenters that did an incredible service to the Poser communities in the professionalism of their content. Many attendees found the content of the eleven webinars rich and rewarding, especially as they go over the recordings of the conference. The materials room, two rigging masterclasses, behind the scenes of reality 3, dynamic clothing, realityPaint, the GoZ plugin & preparing models in zBrush for Poser, composition and story telling with Poser, lighting, rendering, a UV mapping masterclass as well as history of Poser the software and it’s communities through the years. This session we have a fantastic interview with Clint Hawkins, who is the CEO of YUR Digital, a content marketplace website that also offers a forum and art gallery for digital artists. Clint offers a great deal of support for content creators selling in the YUR digital store. YUR hosts regular competitions and there is one running right now with the theme “twisted”. This has a first prize of “Filter Forge Professional 3” software. With over 30 years of experience in the computer and digital art industry Clint Hawkins leads the daily operations of YURdigital. Clint’s extensive and stable work history includes 17 years as a computer engineer for Data General, three years as a Systems Administrator with S1, 10 years with Bondware and three years as a successful business owner and eBay Power Seller.While at Bondware Clint worked his way up from a volunteer Moderator, Product Tester, to Market Place Manager. 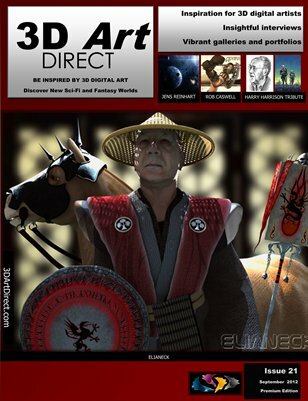 He played an integral part of the successful and rapid growth of the Renderosity digital art marketplace. He has an intimate knowledge of what it takes to grow this type of business from the ground up. Most recently Clint spent 8 months assisting RunTimeDNA with their day-to-day operations expanding his experience, knowledge base and exemplary reputation. His technical background, business experience with two digital art brokerage sites and his own business, combined with his positive reputation put him in a position to make YURdigital the place to get exceptional digital art content from extraordinary digital artists. How Clint provides a continuous stream of wise and useful quotations for his Facebook followers! Clint’s involvement with Renderosity and what he learned as he helped successfully grew the market place. How YUR Digital was started and some of the early hurdles when setting up the company. Clint outlines the steps for a new seller who wants to start selling digital art content. The marketing successes of Clint’s wife Lillian who is the marketing director at YUR Digital. The role of Baron Thomas Von Buettner, who is the YUR-Roving Reporter in the Visual Effects motion picture industry. If you’ve enjoyed listening to this episode via iTunes, then please leave a brief review of our podcast, which will help other digital artists benefit from the content! Terragen 2 and X-Frog plants. How easy is it to populate a scene with vegetation? Is it quite scalable in terms of the amount of vegetation that can fill a landscape? Has Ranch Computing’s render farm service been put to good use by hobbyists as well as professionals? The discount available for Terragen 2 with X-Frog bundle during the Christmas 2012 period. For those of you who don’t know much about Terragen, I can tell you that If you like the idea of applying 3D graphics to create photo-realistic natural environments, then Terragen is definitely for you. Another upside of this software is if you go to planetside.co.uk and go to the products section, there is a free edition of Terragen2 as well as the original Terragen Classic. Both create natural realism for environments, but TG2 being the latest version, has the greater power and sophistication and it now sports the ability to create animations, where you can fly a virtual camera through your landscape and create a movie. 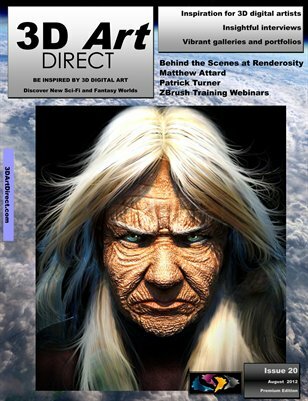 This month of December 2012, the 3D Art Direct podcast and the magazine is promoting Terragen and it’s community. So if you are a Terragen user and a community member at one of the forums and are listening to us for the first time, welcome to the podcast and I hope you enjoy the treats that we have in store for you. The biggest treat I have for the Terragen community is that we are creating a live conference, called TERRALIVE for the Terragen 2 and Terragen Classic users on the 19th to the 20th of January 2013. You’ll have the opportunity to to connect with other Terragen users and expert artists in a live setting through the use of webinar software, so you won’t even have to arrange travel or accommodation to be at the conference! The advantage of this event, is that you can get to directly meet artists that you’ve previously only seen in a forum. You’ll hear their voice and see their own computer desktops as they go through various techniques, tips and tricks to help you get the best out of the Terragen software. You can ask them, either through audio or by instant messaging points you don’t understand and get to learn much faster than ever before. There will be five sessions (and perhaps a bonus sixth session), each led by a different expert artist. We are pleased to include Martin Huisman AKA Tangeled Universe from New World Digital Arts which is a great resource for Terragen 2. If you are going to take just one action from this podcast, I’d like you to note down this web address www.3DArtLive.com/TERRALIVE. Here you can sign up for the introductory session of the conference being held on the earlier date of Saturday the 5th of January at 08:00PM GMT. This webinar will give more details about the main conference event, but you’ll also meet Danny Gordon, moderator for a number of Terragen forums as well as Martin (Tangled Universe) and we’ll give some of their top tips for Terragen 2 and Classic. Of course, you’ll also meet other members of the Terragen community. Enjoy our interview with Ocean and listen out for the discount package on Terragen 2 that Oshyan mentions at the end of the podcast. My interview this session is with Shaun Williams, who is the king of mass space model production, creating numerous models for the various games software he has worked on through the 20 years of his career. After listening to the interview, I’d love to know your successes in creating models for games. In association with this I have been reading today that there has been a noteworthy article from the U.K.’s The Independent newspaper announcing that the Museum of Modern Art in New York has publically supported computer games as a form of art. This of course includes 3D games. There has been a lively debate over the last decade of whether games can be described as art. With this announcement from this prestigous New York art museum, then it looks official, that games can be described as art! Visitors to the Museum of Modern Art will soon see Pac-Man displayed alongside Andy Warhol and Picasso. Initially there are 14 video games, including the iconic Pac-Man, Eve on-line and Myst (Chuck Carter interviewed in issue 12). to start off this new category in its collection. One expert who advised the curators, said gaming could increasingly become “one of the most important” art forms. The museum sought out scholars, historians, critics and legal experts from the computer game world to draw up a list that includes The Sims, a series which by last year had sold over 150 million copies. Art connoisseurs may raise an eyebrow as gamers will actually be able to play the titles in the gallery. So perhaps in years to come, some of the work that my interviewee Shaun or you the listener is creating may end up in an Art Museum, with pride of place! Shaun has about 20 years of modelling experience – including texture/uv mapping, high and low poly modeling, real time 3d engine experience such as Unreal versions 2 and 3, UDK, Freespace, Unity as well as years of game design experience. He has a BA honours in games design and his passion is for games and entertainment and has a keen interest in sci-fi. He specialises in low and high poly modeling for environments, vehicles and props. He sells high quality sci-fi models online through various brokers. He also like to design and concept sci-fi and futuristic weapons, vehicles, props and environments and has experience with animation for film and games. Over the years he has used many 2d and 3d applications dating back to delux paint on the Amiga. Shaun has a BA honours in Games Design from UCLAN (Preston). What inspired him to take the course and what were some of the highlights. Does Shaun recommend other prospective students to take the course? What is Shaun’s preferred 3D engine? What are some of the pros and cons of the engines he has worked with so far? What is some of the more popular models Shaun sells and is it that sets them apart? Shaun has created a fictional story that includes his ship designs as part of the narrative. Shaun mentioned in his original magazine interview : “The spaceships I design are practical, functional and believable. I make every ship look like the purpose it is designed for.”. We ask if he has a set of hurdles that he tries and put his designs through in order to get that practicality and functionality? What skills are involved in creating a good low poly model, as opposed to a high polygon model? One tip Shaun includes is “always think outside the box, especially with sci-fi. Too many people are still inside the box, and to stand out a little more you have to come up with creative and imaginative new ideas and concepts.”. How can people think out of the box to come up with more original new ideas and concepts? What do Shaun do to try and break the mould? What are you working on at the moment and what are a few things you’ve learned from the project? If you feel that this podcast session has been of value to you, leave us a review on iTunes! Since his fingers could hold a pencil, Rob has been passionate about designing sci-fi spacecraft. He was trained as scientist but is terrible at math, so he’s spent his career as an illustrator and designer. He’s produced illustrations for many games, in many formats, and has done interior illustrations for a number of sci-fi novels. You can see his current works on his Deviant Art profile under the username Arcas-Art. Tom Peters has been thinking about spaceships since his childhood. He isn’t a rocket scientist, but he’s worked with some, as a Technical Illustrator for a NASA subcontractor. He’s been an Illustrator and designer in the computer and paper game fields, and has done cover art for science fiction novels.He’s also a Insturment-rated Private Pilot. You can check out his illustrative works at Deviant Art under the name Drell-7. 1. What separates a “bad” sci-fi vehicle design from a “good” one? Factual spacecraft have their designed firmly centred in function. But you would hope that fictional spacecraft design should hopefully be advanced enough to include more aesthetically pleasing features. A bit like the Ford Model T vs the DeLorean. Early cars such as the Ford Model T doesn’t even have cup holders, but the DeLorean has cool doors and is made of out stainless steel and it’s so good it gets its own movie! Science fiction has an audience, that includes scientists that design space hardware– but even they want to be entertained! Organisations creating real world spacecraft now have tight funding, so designs can’t afford to be superfluous. A Mix of the Two (Star Trek) . They like nice looking ships, but they would prefer some explanation (even if its an attempt) about how some of the bits work. But perhaps an official answer is that a good a sci-fi spacecraft design has the majority of it based around function, rather than cool looks or too many greebles. 2. Since it’s science fiction, does it even matter? It matters if you want to earn a fast buck and fill movie seats or have your sci-fi authored books fly off the shelf! What do you want your audience to do? To react with “cool” and drool, or to talk about the finer points of how ion drives work? By coming up with designs that have style you can just “reverse engineer” the functionality back into it. Imagination will find a way. 3. What do you think of as some of sci-fi’s “bad” designs, and why? Find out in the podcast what we consider the worst designs in the universe to be. 4. What about the genre’s “good” designs, and why? 5. Isn’t it asking too much for artists to be scientists AND engineers as well? Yes. It’s hard enough to learn all the knobs and buttons to create a 3D digital model in the first place. The artist is craving feedback as well; is he going to get it by designing a functional and ugly spaceship? 6. Are there any cases where what you call “bad” designs that could be good? Is this a case of “reverse engineering” the functions back into a sleek (or bad) design. 7. What do you see as the forces that have shaped scifi spacecraft design through the years? – Designs influence other designs…eg Leonov influenced Omega Class Babylon V destroyers. There’s a rotating space station and a streamlined space shuttle in George Pal’s 1954 Conquest of Space that prefigured 2001 A Space Odyssey by some 15 years. – Industrial Light & Magic’s (ILM) Colin Cantwell created the concept model that established the TIE fighter’s ball-cockpit and hexagonal wing design for A New Hope. Initially given a blue color scheme, the TIE fighter models for the first Star Wars movie were grey to better film against a bluescreen; TIE fighters in the next two movies shifted back to being a muted blue. Budgets due to popularity of sci-fi at the time. Eg Star Wars was produced on a low budget from models made with bashed up model kits. – It depends on how the illustrators and production designers were directed. 2001 was driven by functional accuracy so NASA input was involved? – Star Trek Star Trek art director Matt Jefferies designed the original Enterprise, which was originally named Yorktown in series creator Gene Roddenberry’s first outline drafts of the series. Jeffries’ experience with aviation led to his Enterprise designs being imbued with what he called “aircraft logic”. – According to Star Wars creator George Lucas, the Falcon’s design was inspired by a hamburger, with the cockpit being an olive on the side. The ship originally had a more elongated appearance, but the similarity to the Eagle Transporters in Space: 1999 prompted Lucas to change the Falcon’s design. 8. Who do you see (directors, production designers, and/or artists) doing the best spacecraft design today? If you have an opinion on spaceship design, leave a reply to this post. What is your favourite spacecraft design? Your worst? 1. So you want to build a rocket and get some good science on how to do so? 2. Tom and Rob decided to design the Leonov spaceship model from the description and concepts written in “2010” by Arthur C Clarke. This ship was agreed to be one of the more scientifically accurate spacecraft in popular fiction. The original template of the Influence Map is a Photoshop template from fox-orion’s gallery at DeviantArt. The story of Suzi quitting her job to pursue a career in digital artwork. What is steampunk and what attracts Suzi to this art genre. Suzi walks us through her favourite steam punk pieces. Making the most of DeviantArt. Tips on getting lighting correct for a scene. Create your Influence Map and reply to this post with a link to it. We’d love to see it! Visit Suzi’s gallery at DeviantArt and leave a message of support and feedback for her artwork! Rob has a good grounding in multiple visual art zones, including science fiction & fantasy illustration for paper and pen RPGs, computer game art and comic book lettering. He’s currently living in Western Massachusetts, operating a digital print business. In the interview we cover the following topics and lots more! – The Spy Girls series with Rob’s character “Cassie Blaine”. – A drawback of 3D Digital Art is that it is easy to have a lack of focus. You can “doodle” for a long time. – Figure work, the more you tweak, the better your chances of imbuing a sense of life and personality. Post a comment if you’ve used Daz Studio for figure work – do you have a mirror to use yourself as a model for certain expressions or poses?! Visit the artists above and support them with feedback at their respective galleries.